I’m partnering with Stonyfield as a member of their Clean Plate Club to bring you today’s recipe. Thank you for helping me work with brands I love! 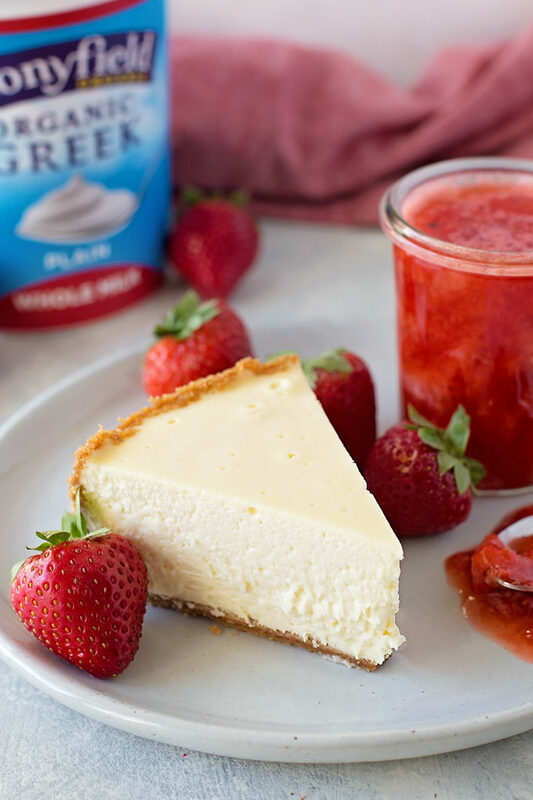 This New York style Instant Pot Greek yogurt cheesecake is so thick and creamy, you’ll want to lick your plate clean! It’s no secret, I LOVE cheesecake! If you’ve browsed the recipe index here on LMS, you’ve probably noticed that I have a slight obsession. 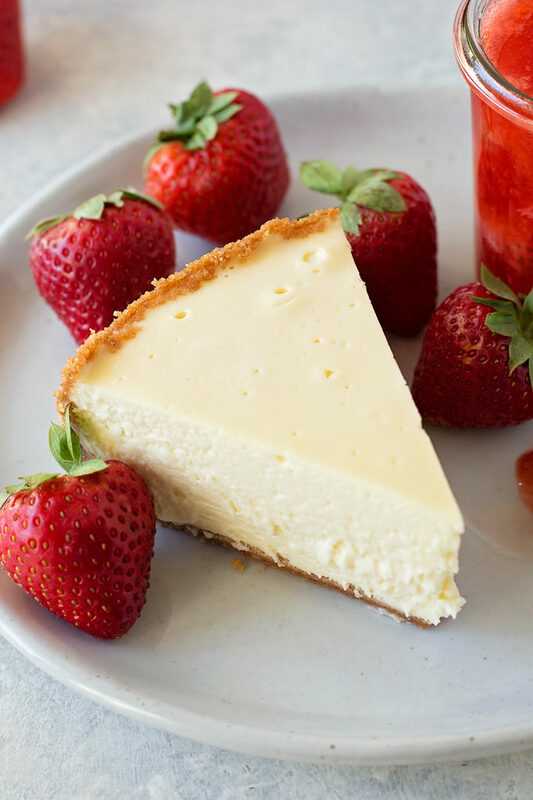 Ever since I started using my Instant Pot, I’ve been dying to create a pressure cooker version of my popular New York cheesecake. After two very unsuccessful attempts I almost gave up. The third time however, was the charm. 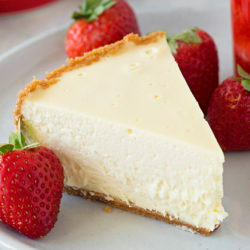 Out came a thick, creamy, luscious cheesecake! Today’s recipe is made in the Instant Pot using the pressure cooker setting. Why use the Instant Pot? For one, it saves you about 30 minutes to an hour of baking time. That might not seem like a big deal, but because this dessert takes a while to chill and every minute helps! You also don’t need to use your oven for more than 8 minutes (or even at all)! The crust is the only thing you need to bake OR you can chill it and skip the oven all together. 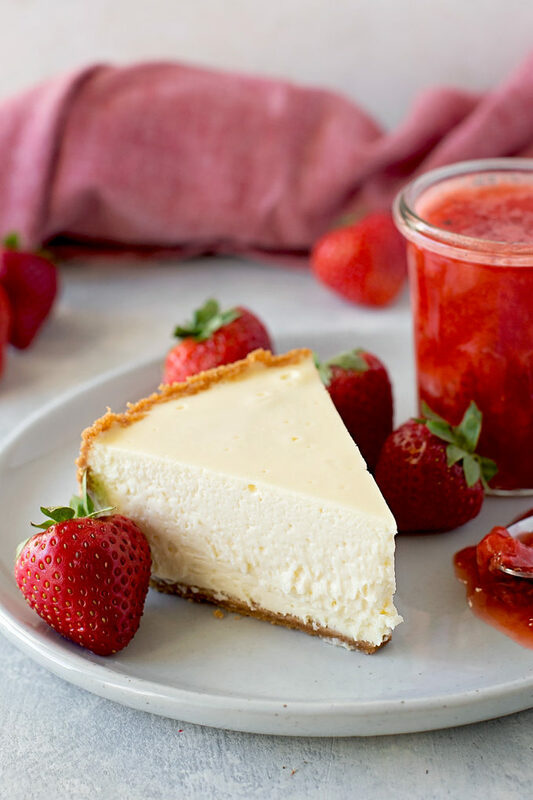 That means you can make cheesecakes all summer long without heating up the kitchen! 🙌 And hello holiday baking! Your oven will be free for all the other goodies on your must-bake list. The two “special” tools you’ll need to make this recipe are: an Instant Pot and a 7-inch or 8-inch springform pan. A 7-inch springform pan will fit on the steamer rack. An 8-inch springform pan will fit in the insert, however, it will not sit on top of the rack. I’m cheap and I really didn’t want to purchase a new pan, so I used the metal sealing ring from a mason jar to set the pan on in the insert. It worked perfectly. The filling is made using seven simple ingredients. I ditched the sour cream and heavy cream and used Stonyfield’s plain whole milk organic Greek yogurt instead. It’s a staple at our house (along with all of their other varieties of yogurt- our kids are fanatics) and I love finding new ways to sub it in cooking and baking. 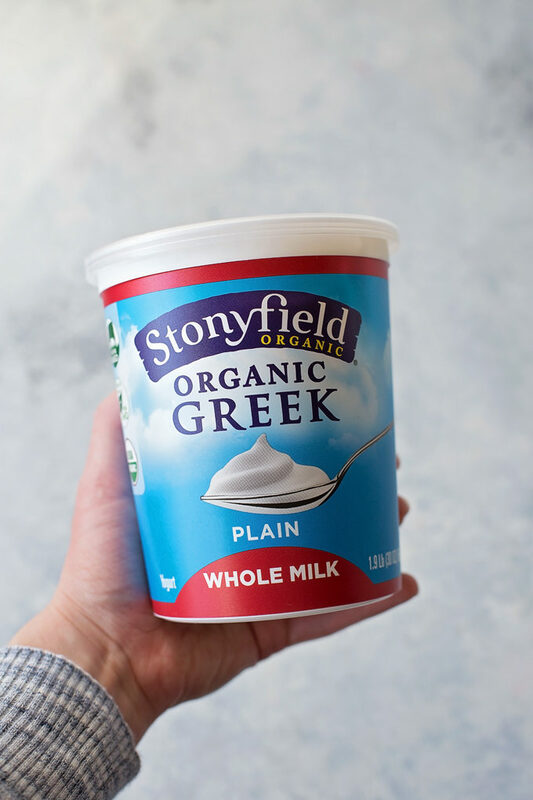 And because Stonyfield is organic, it’s made without the use of toxic persistent pesticides, artificial hormones, antibiotics and GMOs. Yay!! Close the lid and select MANUAL mode (high pressure) for 45 minutes. I know. That seems like a crazy amount of time for a pressure cooker, but I promise it’s right. Remember how I said it took me 3 times to get this recipe right? The first time was a flop because it had too much filling and the second was a flop because it wasn’t cooked for long enough. The third time I went for it and added almost 10 minutes to the original amount of time. I’m so glad I did, because the cheesecake came out looking and tasting amazing. Let the pressure release naturally. It takes about 18-20 minutes. This will help prevent the cheesecake from cracking. 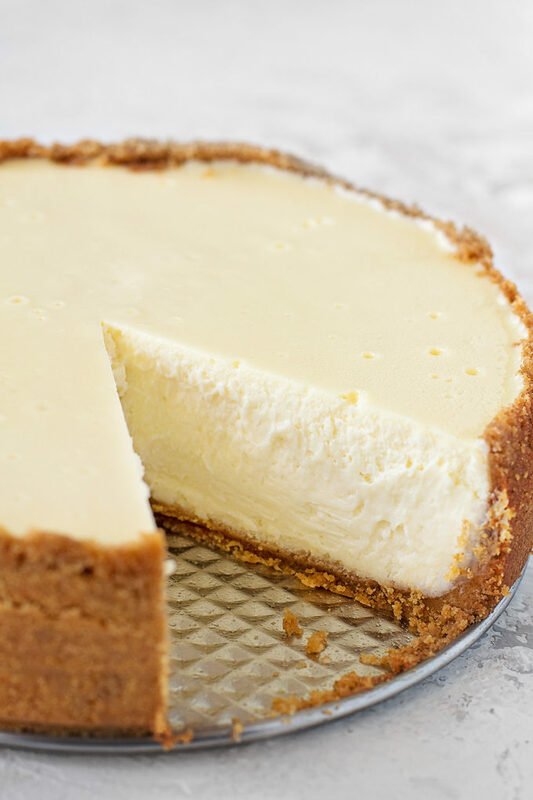 Unwrap the cheesecake and let it cool at room temperature for 30 minutes (this will also help prevent cracking), then refrigerate it for at least 2 hours before serving. I like to let mine go for 4 hours, but I prefer firm cheesecake. 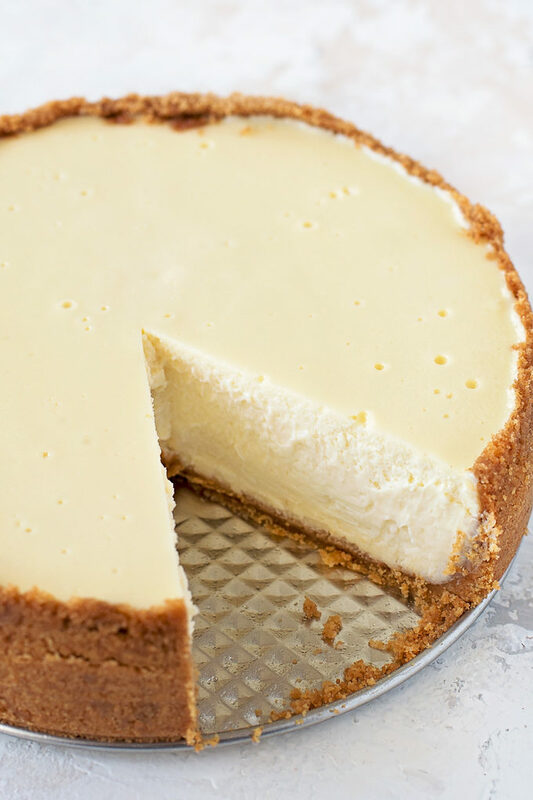 You can serve this delicious cheesecake as-is, or you can top it with just about anything. Think fruit sauce, salted caramel, whipped cream, or chocolate. 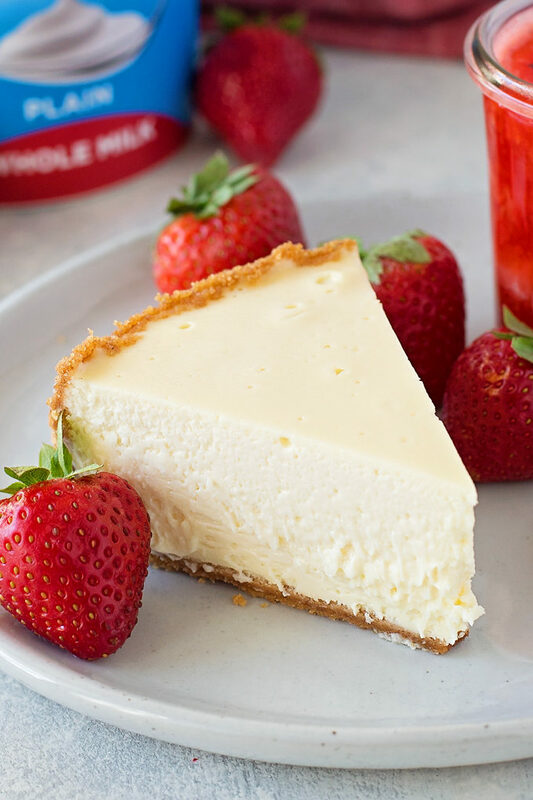 This Instant Pot Greek yogurt cheesecake is sure to be a hit! Looking for more ways to use yogurt in sweet and savory recipes? Check out stonyfield.com/recipes for inspiration! Preheat oven to 350 degrees. Lightly spray a 7-inch or 8-inch springform pan with baking spray. Wrap the outside with foil, crimp around the top edges of the pan. 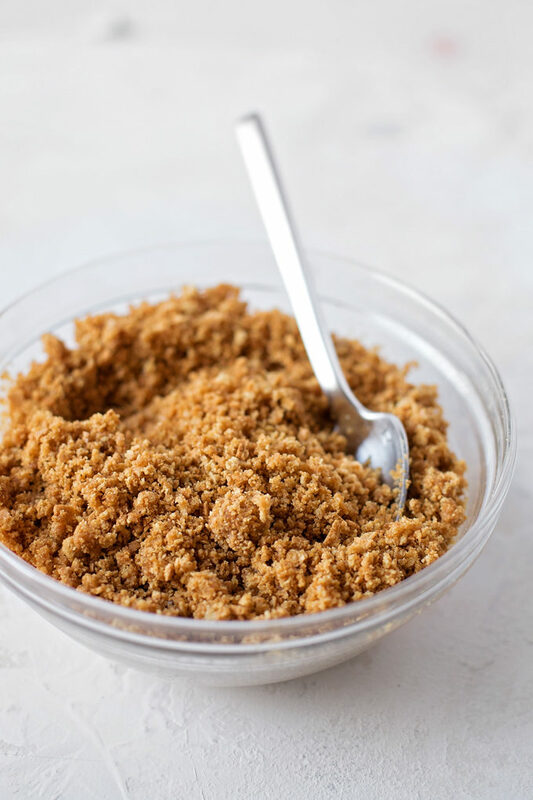 In a large ziploc bag or a food processor, crush the graham crackers until fine. Add butter, brown sugar and salt, mix to combine. Press into the bottom and up the sides of the prepared springform pan. Place in the oven and bake for 8 minutes. Remove and allow to cool while preparing the filling. To prepare the filling, in the bowl of a stand mixer or a large mixing bowl with a handheld mixer, add the sugar, cornstarch and salt. Mix on low to combine. Add vanilla extract and Greek yogurt, mix on medium until creamy. With mixing speed on low, add cream cheese. Turn mixing speed up and beat until smooth, about 2 minutes. Add eggs and mix until combined, about 1 minute. Pour the filling into the baked crust. Tap on the counter 3-4 times to remove air bubbles. Cover the top with foil, pressing tightly to seal it in. Pour 1 1/4 cups of water into the Instant Pot. If using a 7-inch springform, place the steamer rack in the bottom. If using an 8-inch springform you’ll need to place something in the bottom of the insert like a metal mason jar sealing ring (it will raise it up enough). Center the springform pan on a foil sling* and lower it into the Instant Pot and onto the rack or ring. Fold the foil sling on top of the cheesecake. Close and lock the lid. Select MANUAL (and make sure it’s on high pressure) for 45 minutes. When it beeps, either turn it off or let it switch to KEEP WARM. Allow the pressure to release naturally (do not turn the presure release to venting). This takes about 18-20 minutes. 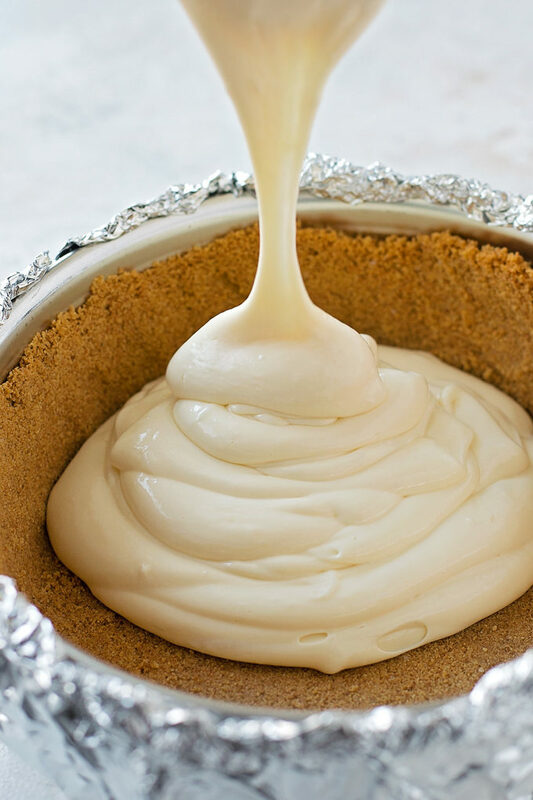 Remove the lid and carefully lift the cheesecake from the pot. Remove the foil on top and peel of the foil from around the pan. Allow to cool at room temperature for 30 minutes before transferring to the refrigerator to cool uncovered for at least 2 hours. For a thicker, firmer cheesecake, cool 4+ hours (placing plastic wrap over top at the 2 hour mark). * To create a foil sling, tear off a 20-inch sheet of aluminum foil and fold it lengthwise four times. – Don’t want to use Greek yogurt? Swap it out for 1/3 cup full-fat sour cream and 1/3 cup heavy cream. – Want something a little more exciting? Add up to 3/4 cup of your favorite mix-ins.